In the summer of 2017, LBWF put out an open call to architects, artists, designers, and landscape artists, inviting them to take part in a programme called Making Places, which it was funding from its own resources to the tune of no less than £1m.. The objective was to commission ‘community arts’ projects for ‘unloved spaces’ in each of the borough’s 20 wards, thus generate ‘places which are brighter, safer and where residents and visitors enjoy spending time’, and so ultimately make ‘a lasting impact on local communities’. Those bidding were encouraged to think imaginatively and promised a budget of up to £40,000 per ward, but it was also emphasised that residents’ views must be valued. Indeed, the commissioning process was fashioned so as to encourage popular involvement. In each ward, a named local counsellor was to start the ball rolling by canvassing locals about exactly where they thought their artwork should be sited. Next, detailed specifications would be published, and a panel of ‘experts’ convened to shortlist from the bids received. Lastly, it was back to the named councillor (and pointedly not an officer, or consultant) for the final decision, with the criteria being what was likely to work best, but also what was ‘most popular’. All of this sounded exciting, even ground-breaking, as LBWF Leader Clare Coghill was keen to underline when talking to the Waltham Forest Guardian: ‘”Waltham Forest is a borough for makers and a borough for radicals, all built around the key element of fellowship. Working together, we can create wonderful pieces of community art that bring joy and happiness to residents and visitors alike. All of these superb commissions will brighten up areas of Waltham Forest nominated by our residents – where they wanted change we delivered it”’. Spool forward a year, and ten projects have been commissioned. Nine are apparently proceeding without much comment. But one, in Cann Hall, has become mired in controversy, provoking highly negative social media coverage, as well as a petition signed by more than 450 people calling on LBWF to (a) reconsider the current proposal ‘in its entirety’ and (b) replace it with one based upon ‘real community consultation’. At first glance, the Cann Hall dispute might be dismissed as a storm in a teacup. But the truth is very different. For as will be demonstrated in the following paragraphs, what’s happening in Cann Hall is emblematic of issues that are now cropping up across the borough – issues to do with consultation and representation, most obviously, but also to do with LBWF’s headlong rush to build an urban infrastructure tilted towards what one of its advisers, consumer specialists CACI Acorn, call the ‘“rising prosperity” category’. and thereby (in their words’) ‘celebrate how past and present migration continues to enrich the borough and its residents’ lives’. In addition, and to firmly root the project in the area, Raw and Holsborough plan to run ten tile-making workshops with an unspecified ‘range of local groups and individuals’; use these workshops to produce 100 ‘bread tiles’ that will be ‘interspersed across the wall at eye level for the public to enjoy’; and gift the kiln used to make the tiles to a local school. 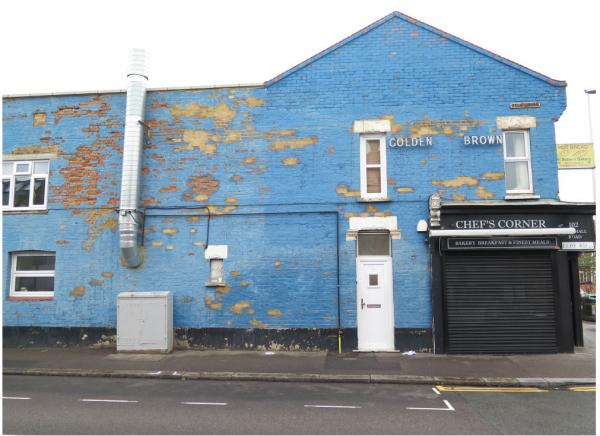 No doubt, when Raw and Holsborough formulated their project, they saw it as wholly uncontentious, the kind of socially attuned public art that was likely to impress a London Labour council. However, the more that the project has been scrutinised, the more that issues have emerged. First, it is worth dissecting the commissioning process, because though sold as an exercise in public engagement, in reality it has been anything but, a broken promise that has triggered much of the present discontent. According to the councillor who has taken responsibility for Making Places in Cann Hall, Sally Littlejohn, from the outset considerable effort was made to stimulate public interest, using everything from leaflets to the ward councillor’s Twitter account. However, effort or not, this exercise produced a mere 22 suggestions from a local population of c.15,000, in anyone’s terms, both a major embarrassment, and a dramatic illustration of lack of reach. Worse, of the 22 suggestions, a mere four were about the bakery side-wall, one more than the next most cited contender, true, but again far from a ringing endorsement. ‘A popular choice – this is the “village” part of Cann Hall, with shops, 2 cafes, a community noticebaord [sic]. This location would be good as a place for a mural that emphasised the community/residential nature of the area. (Cann Hall Rd is a through route from Stratford to Wanstead, and suffers from speeding, but for the locals it’s their home.)’. Given that for some years Cann Hall has been one of the most densely populated wards in London, her regard for those who flattered themselves that they lived in a ‘village’ is surely revealing. So much for the artwork’s siting, what about the shortlisting of the bids? The ‘expert’ panel chosen for this task appears to have comprised some or all of the following: Louise Jeffrey, arts director at the Barbican; Tamsie Thomson, director of the London Festival of Architecture; Mark Godfrey, executive director at Soho Theatre; Hadrian Garrard, director of Create London; and Harriet Warden, Blackhorse Workshop creative director. Turning to how the panel went about its business, information is again limited. Questioned under the Freedom of Information Act, all that LBWF has released regarding the Cann Hall bids is some discussion notes, set down on four pages of plain paper; unsigned and undated; and without either an attendance list or scoring grid. Nevertheless, unsatisfactory as these notes certainly are, they do go some way to explain why the panel rated Embedded Bread so highly. Raw’s ‘track record and reputation’ was noted from the off (‘Matt…has just completed a major and outstanding project for Art on the Underground in Seven Sisters…[and] a ceramics residency at the Victoria and Albert Museum’) and the project itself was judged favourably, both because of its close links to the bakery’s alleged heritage, and because ‘If done well, this could be really beautiful’. Reservations were noted about the budget, which was described as ‘ambitious given the scale of the installation’; there were ‘some unknowns’; and feasibility work was ‘required’. Nevertheless, having satisfied itself that ‘if necessary the installation could be scaled back and would still be effective’, the panel declared this to be their winner. Cllr. Littlejohn now had to provide the final sign off. One again, there is no public record of what transpired, but it is reasonable to assume that she was loath to rock the boat. The ‘experts’ had spoken, and the clock was ticking in terms of spending the allotted budget. Besides, at this time Cllr. Littlejohn had other pressing concerns, since she was about to become Mayor, and was also heavily engaged in trying to gain a Parliamentary candidature. Against this background, it was unsurprising that she played safe, and rubber stamped the panel’s verdict. All told, therefore, the commissioning of ‘Making Bread’ followed a trajectory that was flawed. Despite all the rhetoric about the importance of public consultation, actual resident input was slight. Moreover, at every stage of the decision-making process, there was a lack of transparency. Little wonder that as the details have trickled out, so public anger has grown. That adequately covers the sad story of commissioning. However, Making Bread has attracted criticism from a number of other angles, too, and these can be briefly summarised as follows. One commonly articulated argument is about the proposal’s morality. Until recently, it is pointed out, Cann Hall was officially categorised as ‘deprived’. Nowadays, affluence may be spreading, but this does not mean that social ills have suddenly disappeared. Amongst other things, there are several pockets of pronounced poverty; gang warfare ebbs and flows; there is a substantial shortage of social housing; the local food bank barely copes; and life expectancy rates are below those in the leafier parts of the borough. Given such facts, is it justifiable to spend £40,000 of public money on what amounts, when all is said and done, to a prettified wall? There is also some related dissatisfaction about the choice of the bakery site for the artwork. The owners of the building are the Butler family, and one of their number is no less than Labour MP Dawn Butler, who, though involved in the 2009 expenses scandal, has risen to become a leading member of the shadow cabinet, and a key ally of Jeremy Corbyn. There is no suggestion that either the family or Ms. Butler have influenced (or attempted to influence) any aspect of the commissioning process – the truth is said to be quite the opposite – but it cannot be denied either that the ‘unloved space’ in need of redemption belongs to them, and exactly like others who may be similarly situated, they will gain from having their property improved. Again, the question arises as to whether this is morally right. Should the public purse be used to benefit any private business or householder in this way? More particularly, should those who fail to keep their property in good order in effect then be rewarded? And wouldn’t it have been wiser for LBWF to site the artwork on public land, and thus avoid these conundrums altogether? A third objection is about Embedded Bread’s purported social message. In explaining their work, Raw and Holsborough argue (as already noted) that it aims to ‘celebrate diversity’ and help local people to learn about ‘each other’s cultures and shared narratives’. However, since they nowhere present evidence that these themes have local traction, they leave themselves open to the accusation that they are simply imposing an agenda, essentially the tired clichés of the local authority playbook. Perhaps more seriously, the linkage between the artwork and the desired outcomes anyway seems tenuous. Put bluntly, if ‘Bread Made Here Since 1891’ resembles anything, it is a contemporary advertising slogan, akin to that for, say, jeans, where a product’s longevity is touted as evidence of its integrity. Finally, there is anxiety about the by no means minor matter of maintenance and upkeep. LBWF advises as follows: ‘When successful projects are awarded, a maintenance plan will be mutually agreed by the practitioner and the Council…We are expecting projects to last for a minimum of five years and so we expect the selected materials to reflect this…All projects should be designed to be low maintenance’. Yet this is hardly reassuring. Two relatively recent pieces of public art in Cann Hall, costing many thousands of pounds, have languished in decrepitude because no money was set aside for their upkeep. What happens if, after five years, with Raw and Holsborough long gone, Embedded Bread is covered in graffiti, or the tile adhesive fails? Will a cash-strapped council pick up the tab? Or will the site once again become an eyesore? Each of these different kinds of criticism merits answering, but at present those in authority appear loath to respond. Cllr. Littlejohn has let it be known that in her view the project should go ahead as planned. Raw and Holsborough have at least had the decency to communicate when contacted, though they too are largely sticking to their guns. Meanwhile, as the stand-off continues, other factors are beginning to intrude. For reasons so far unexplained, the project already has been subject to multiple delays, and this has eaten into the budget, so that, for example, though a local school will receive a kiln, it will be smaller than originally envisaged; there is a question mark about exactly who is going to pay for the scaffolding necessary to mount all the tiles; and Mathew Raw has been quoted as complaining that, as his costs have escalated, he is now ‘working for free’. For the moment, therefore, the bakery side-wall looks as unloved as ever. And as for the £40,000, well, your guess is as good as mine. Analysis of the other nine Making Places projects so far commissioned reveals that the great majority are straightforward enhancements of existing public spaces; and in six cases (at least) some attempt was made to directly involve the public prior to starting work. All of which further underlines the sense that Embedded Bread – for whatever reason – is out there on its own.